I've often had trouble finding a squash hidden under all the leaves until it was way too big, so this year I put a tomato cage over one squash plant just to see what would happen. It grew straight up into the cage, making it easy to see even the smallest one. It's been much easier to harvest them so far up off the ground. It was a surprising bonus that squash bugs didn't do much damage to this plant, while nearby 'ground grown' squash have wilted away one by one as squash bugs increased over the season, even after a variety of organic sprays and one desperate try with a regular garden spray. This caged plant is the only one still producing. Most squash bugs just don't seem as inclined to climb that far up off the ground. If sprays are needed, it is easier to see where to spray and reach under all of the leaves, and it's been so easy to water in some organic fertilizer around the base. Next year, all my squash, both yellow and zucchini, will be in a neat row of cages. What a great idea! My zucchini has engulfed my small patch this year. I know what to do next year. Thanks for sharing! Definitely going to file this one away for next year! Thanks for a great idea! That is fantastic! It is so disheartening to just begin getting a good harvest, only to find the plants beginning to wilt from the squash bugs the next day! This idea will go into effect next year for sure... I love vertical growing since I have a small garden. One question, did you have to guide the plant up into the cage at all? What a great idea! I'm going to try it on cucumbers next year and see what happens. By the way, about 25 years ago I learned that if you plant radishes with the squash or cucumbers, and leave the radishes in the ground through the season, you won't have trouble with squash bugs. Worked for me. Of course, the radishes are not fit for eating by this time. To the one who asked if the squash had to be trained up into the cage...no, I don't remember having to do that. I may have pushed a leaf or two inside without thinking about it, but it pretty much grew straight up once the first few leaves were inside the cage's first level. To the one who mentioned that radishes planted nearby would keep squash bugs away, THANKS! I'm putting that into my gardening plan for next year right now! To everyone, thanks for the nice comments, I'm so glad you enjoyed the tip. I'm always looking for more ways to squeeze a few more plants into my garden while still keeping it easy to care for. I've found so many good ideas on ThriftyFun, thanks for all of YOUR ideas, too! Cages do work great with cucumbers too. This is the reason I read these posts: for the helpful and appreciated tips. Thank You! 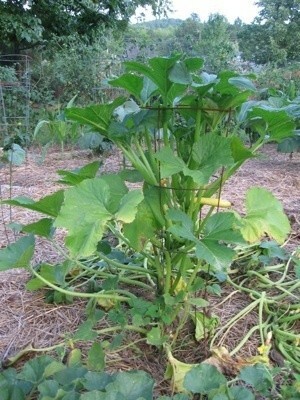 I've just had to pull my squash plants due to rotting and bugs, and wish you had posted this tip in the spring. Can't wait to try it next year!